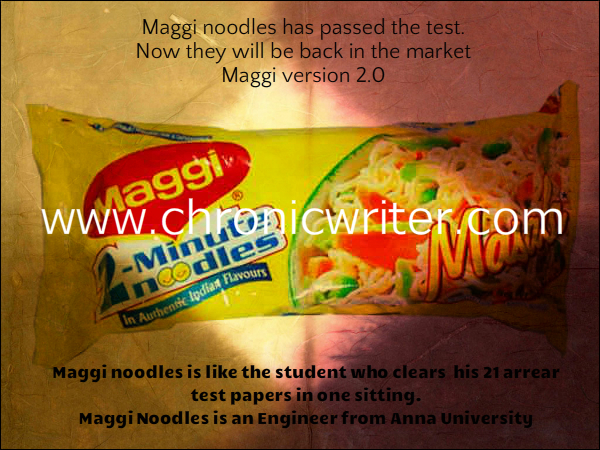 Maggi Version 2.0 is entering the market again. This is like Rajini's re-entry as MGR in the movie Sivaji with the motta boss look. Hostel girls and bachelor girls are going to go crazy again with this news. Nestle India, maker of Maggi noodles, on Friday said it has received test results from all three laboratories mandated by the Bombay High Court to test Maggi noodles samples. "All the 90 samples, covering 6 variants, tested by these laboratories are clear with lead much below the permissible limits," the company said in a statement. ""In compliance with the orders of the Hon'ble Bombay High Court, we will now commence manufacture and will start selling only after the newly manufactured products are also cleared by the designated three laboratories," it said. Hi, your posting is very interesting . You share about maggi version 2.0 in unique way. I happy to say i get more information of maggi noodles. you are doing a great job . Keep it up.